There has been a lot of curiosity about Zimbabwe’s Facebook population lately. Unfortunately Facebook doesn’t provide Zimbabwe’s Facebook stats because of, well, you guessed it, we’re a bad people. Or at least the targeted US sanctions say some leaders here are. I discussed this situation with our development department. The reason why Zimbabwe is not in our statistics is that Facebook API does not pull data for it. (As I mentioned in previous email). This “issue” is the main reason that caused this situation and unfortunately we are not in a position to influence it. We can only reach data that is pulled out of Facebook API. I hope you understand this complicated situation and we apologize for inconveniences caused. We’ve even tried getting mad about it. Didn’t help. Creating our own social networks definitely will, but before we all move over to Sha, Facebook is a reality we have to deal with. Zimbos love it! So anyway, the curiosity increased after we posted the Google Plus stats two days ago. Now instead of waiting for Zuckerberg to un-target Zim, or wait for some of our politicians to become more likeable people to the US, we thought we would just take figures from other African countries, average them and use the data to estimate to Zimbabwe’s stats. Rough estimate at best. Why not? 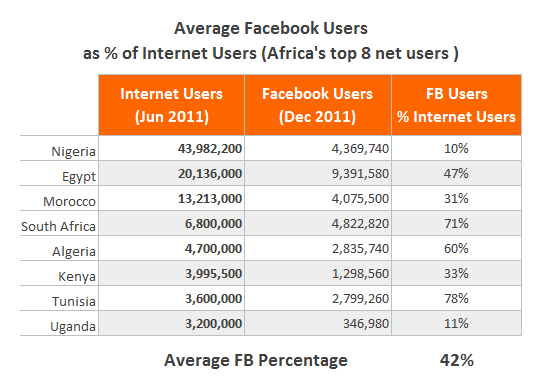 As you can see the average number Facebook users as a percentage of internet users in the 8 countries is 42%. Anyway, we conservatively (very) estimate the number of internet users in Zimbabwe to be 2.5 million. So: Econet says it has at least 2.1 million internet users and that’s 37% of its subscribers (well, SIM cards) using the internet. Now if we assume that both NetOne and Telecel have at least 20% of their subscribers (1.86m and 1.46m respectively) on mobile broadband, that’s an additional 600,000 people on the internet in Zimbabwe. And because we need to be as conservative as possible, let’s just assume that subscribers using fixed and mobile (WiMax) internet from the 14 internet access providers also have internet from either of the 3 mobile providers above. Let’s not count them and leave our total number of users at 2.7 million. But there’s the multiple SIM card issue as well. Let’s knock off 200,000 from our total to take care of the overlaps and remain with just 2.5m. Now let’s apply our 42% Africa average to that figure. That give us some 1.06 million Zimbabweans on Facebook. I’d say there’s definitely more, but I’d have no data to back this except that I know Zimbos love Facebook. @aKabweza it seems a bit low for sure but it definitely gives an indication. Information like this should be beneficial to corporates, at least those that have embraced social networking as an advertising tool and as a customer services consultation platform, imagine a potential 1 million customers are waiting for them! Some studies on the Fortune 500 companies show that most of those successful companies are actively participating in social networking through Facebook, Twitter, e.t.c to interact with customers to improve service delivery and operational efficiency. Excellent work given the challenges you had to go through to come up with the figures. Keep it up! Nice work Techzim. I would tend to agree that there are more of us on FB, but then we don’t have the accurate parameters to accurately estimate the number of Zimbos on FB. One Question I have for Zuckerberg is this ‘How do sanctions’ or ‘The Zimbawean political situation’ affect them when it comes to FB? In fact, if the ‘issues’ were solid why are they allowing us to create FB accoutns in the first place? 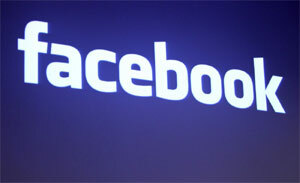 1m Facebook users is way over-stated. You need to revisit your assumptions. its 4 million Rob u wish zimbabweans were so illiterate and laggards when it comes to tech ha ha ha ha ha shame on u,u must british or american moron.